Tumult in the bacterial community that occupies your gut—known as your microbiome—doesn’t just cause indigestion. For people recovering from a stroke, it may influence how they get better. 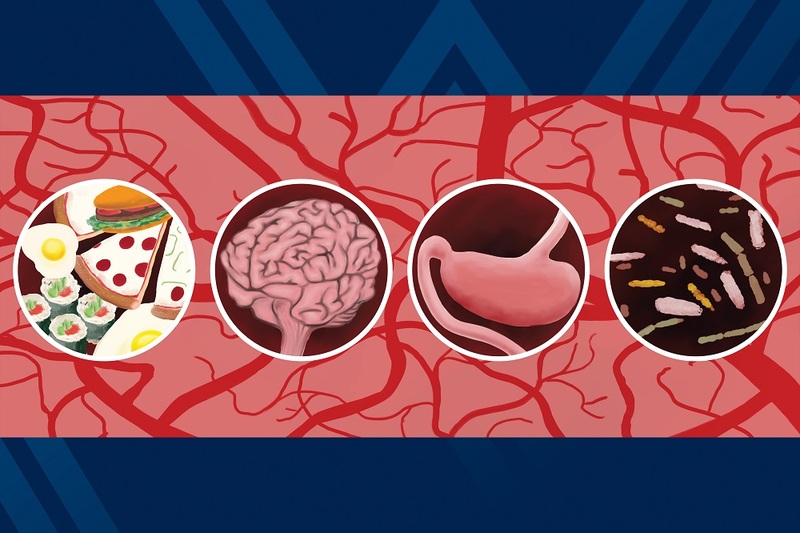 A recent study by Allison Brichacek and Candice Brown, researchers in the West Virginia University School of Medicine, suggests that stroke patients’ microbiomes—and even the structure of their guts—may still be out of kilter a month after the stroke has passed. “We’re interested in the gut-brain axis—how the gut influences the brain and vice versa,” said Brichacek, a doctoral student in the immunology and microbial pathogenesis graduate program. She presented her findings at the International Stroke Conference in February. Previous studies indicated the immediate effects a stroke can have on someone’s microbiome, but they didn’t explore whether these effects lingered. To find out, Brichacek, Brown and their colleagues—including Sophia Kenney, an undergraduate majoring in immunology and medical microbiology, and Stan Benkovic, a researcher in Brown’s lab—induced a stroke in animal models. Other models—the control group—didn’t have a stroke. The researchers compared the two groups’ microbiomes three days, 14 days and 28 days post-stroke. They also scrutinized their intestines for microscopic disparities. One of the researchers’ discoveries was that a certain family of bacteria— Bifidobacteriaceae—was less prominent in post-stroke models than in healthy ones both 14 and 28 days out. If the name of the family sounds familiar, that’s probably because Bifidobacterium—a genus within the Bifidobacteriaceae family—is a common ingredient in yogurt and probiotics. These bacteria are known for supporting digestive health and may be associated with better outcomes in stroke patients. That may sound like bad news for people who have had a stroke, but the loss of Bifidobacteriaceae bacteria isn’t the only long-term change their microbiomes undergo. Another family associated with worse outcomes—Helicobacteraceae—was also more common in post-stroke models 28 days out. The practical implications of these microbiotic shifts are still unknown. The team also found that the ratio of one type of bacteria—Firmicutes—to another—Bacteriodetes—was higher in post-stroke models. After 14 days, the ratio in the experimental group was almost six times higher than in the control group. After 28 days, the experimental group’s ratio had fallen, but it was still more than triple that of the control group. Having a high Firmicutes-to-Bacteriodetes ratio can be concerning because of its link to obesity, diabetes and inflammation. The gut-brain axis seems to distribute a stroke’s effects in another way, too. The research team discovered that a stroke can cause intestinal abnormalities. Under magnification, the intestinal tissues of healthy models resembled an orderly colony of coral. The branches of “coral” were actually villi—tiny projections that increase the surface area of the intestinal wall and multiply the amount of nutrients it can absorb. But in post-stroke models, the intestinal tissue looked scrambled, even a month after researchers triggered the stroke. “There’s disorganization here,” Brichacek said. “There’s also less space between the villi to allow nutrients to move around.” Poor circulation of nutrients can lead to compromised stroke recovery. What does all of this mean for stroke recovery? “Big picture: seeing a persistent, chronic change 28 days after stroke that is associated with this increase in some of the negative bacteria means that this could have negative effects on brain function and behavior. Ultimately, this could slow or prevent post-stroke recovery,” said Brown, an assistant professor in Department of Neuroscience and faculty member in the Rockefeller Neuroscience Institute. Her and Brichacek’s findings may point to new therapeutic options for stroke. “If it ends up being that the gut has an influence on the repair of the brain, maybe our stroke treatments shouldn’t just be focused on what we can do for the brain. Maybe we need to think about what can we do for the gut,” Brichacek said. For example, some bacteria in the gut produce short-chain fatty acids that affect brain function. “Some of these short-chain fatty acids are good, and some are bad,” said Brown. “If the bacteria that produce some of the bad short-chain fatty acids are proliferating, that could have a negative outcome for brain function.” Could nudging a stroke patient’s microbiome in a healthier direction—using probiotic supplements or prebiotic foods, for instance—help prevent emotional or cognitive decline? Likewise, might it be possible to lower a stroke patient’s Firmicutes-to-Bacteriodetes ratio and promote weight loss, decrease diabetes risk and make subsequent strokes less likely? Research reported in this publication was supported by a genomics pilot grant from the West Virginia IDeA Network of Biomedical Research Excellence, part of the National Institutes of Health’s Institutional Development Award. Allison Brichacek’s work received additional support through the NIH T32 Training Program in Stroke and its Comorbidities. Candice Brown’s work received additional support from the West Virginia Clinical and Translational Science Institute (through National Institute of General Medical Sciences CTR award U54GM104942). The content of this publication is solely the responsibility of its authors and does not necessarily represent the official views of WV-INBRE, CTSI or NIH.